There's going to be another Uncharted game?! Quick, hide all the precious historic artifacts! Raise airport security! Alert the United Nations to the threat! Make sure... What? No, I don't think I'm overreacting. The recent announcement of Uncharted 4: A Thief's End has by now generated a ton of excitement. I'm sure that it will make for a fine addition to the franchise. 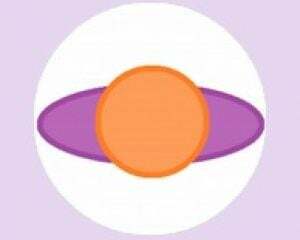 However, our collective excitement for another installment should be put on hold. 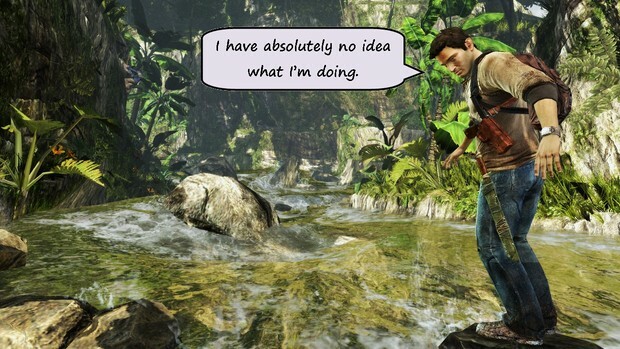 We need to talk about Nathan Drake's bad habits, and whether or not we can afford to let him run around on another adventure. I'm not the first to raise a discussion around the questionable actions of the Uncharted protagonist. There are many gamers that share these concerns; Drake's past is strewn with corpses and chaos. In the teaser for the fourth instalment, Drake gave the impression that he might be slowing down (the game title has a sense of finality to it) but hundreds more people and artifacts will be inevitably destroyed, even if this is the last game. I would like to take this discussion further. Let's face facts -- not only is Nathan a blundering, murdering psychopath, he is quite categorically incapable of doing anything good. He's not especially evil -- there are honest intentions in him somewhere -- but he is a complete calamity and far from being any kind of hero. Any good he manages to do is overwhelmed by all the bad he does. If Nathan Drake is allowed another adventure, we can expect an even greater level of devastation. Mr. Drake is a man doomed to repeat a cycle. In each game, he learns of a piece of history lost in time and seeks it out. The treasure inevitably turns out to have been lost deliberately or hidden for good reason, and for that reason the 'bad guys' are also seeking the relic. Each time, Nathan deems himself the only person fit to prevent these bad guys from unlocking the evil potential. To put it bluntly, without Drake those bad guys wouldn't make it anywhere near their objective. Not only do they fail to actually find what they are looking for without his help, the evil surrounding the treasure would be enough to see them off. In each Uncharted game, Nathan Drake is directly responsible for pointing the bad guys in the right direction and helping fight a way through to the evil artifact. In Uncharted: Drake's Fortune, Nate practically hands a rival mercenary the answers he needs to find El Dorado, instead of murdering him and his friends in the usual Nate Drake style. He then manages to escape and meet up with lady-friend Elena. By this point he is out-manned, out-gunned, he thinks Sully is dead and he has no idea that the treasure has evil properties. 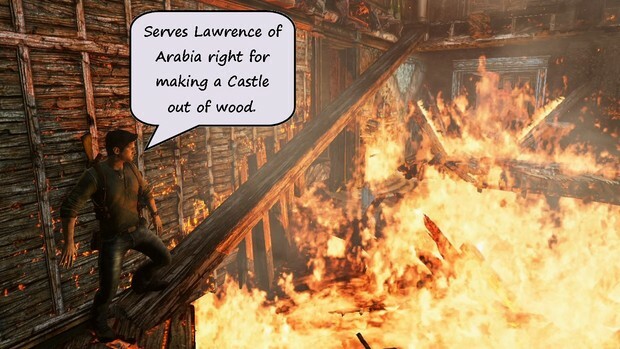 His reasons to carry on adventuring can be summarised in one sentence -- I've got nothing better to do. When Nathan arrives on the island, the cursed inhabitants are making short work of the mercenaries, who can't find the entrance anyway. It's up to Drake to figure things out and clear the way, despite learning that what the bad guys are searching for is not worth finding. Sure, he manages to win in the end, but only just. And then there's the destruction. He kills lots of people, true enough, but as a Teacher and a Historian I find Drake's rough-shot approach to treasure hunting utterly appalling. When he isn't desecrating ancient graves or setting fire to historic sites, Nathan wastes little time in reducing forgotten cities to ruin. I am aware that the end of each Uncharted game is merely complying with the age old cliche for ending action stories -- the self-destruct style finale -- but we can't ignore the fact that wherever Nate goes, history gets crushed under his boots. It's not just large scale destruction of History; Nathan shows disdain for the little artifacts too. When exploring the world he discovers a significant amount of small, ancient artifacts, which he builds into a collection throughout each game. Do these hold any interest for Nate? Does the discovery of each treasure excite him? Nope. Each trinket is added to the pile without a second glance. By the start of the next game these items are gone. No explanation given. No final cutscene where Drake admires his collection of historic wonders. These priceless items should have been delivered to a museum. Instead, Drake most likely sold them off to the first person with money or dropped them down a hole somewhere. One last thing. 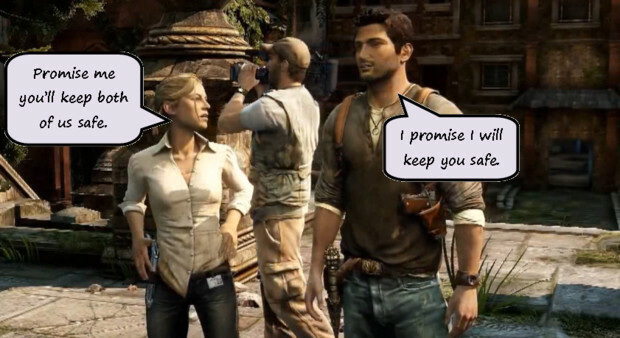 It's an obscure argument, but one which says a lot about Nathan Drake. Consider his name. Nathan Drake. Drake. Nathan chose that name (his birth name is currently unknown) and to the historian in me, that speaks volumes about the man's character. At first glance you might think that our protagonist wanted to emulate a famous and heroic British explorer, a daring seafarer. But that's not the full story of Sir Francis Drake. Oh he was a hero to the British, but to the rest of Europe -- and especially the Spanish --Sir Drake was a notorious pirate. Technically he was a 'privateer', which essentially makes him a state-funded pirate, but the fact remains that Nathan Drake's namesake was a pretty cruel, violent, thieving man in his time. Someone that present day Nate is clearly inspired by. 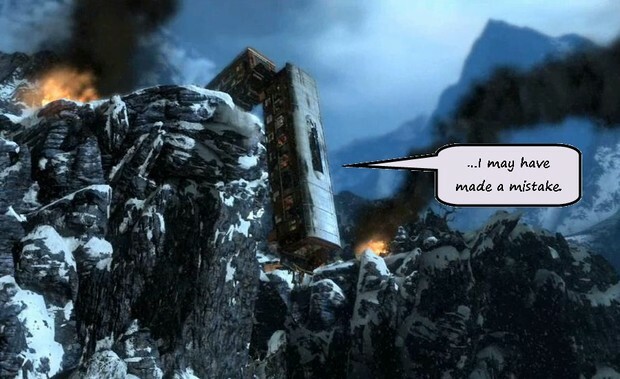 Whether you've played and/or enjoyed the Uncharted games, there can be no denying that Drake is the worst kind of hero. His only real achievements in each game are (a) he hinders the bad guys slightly more than he helps them, (b) he's somehow still alive, and (c) he hasn't managed to break all the historic artifacts known to man. Not only should we be worried about the death and destruction awaiting us in Uncharted 4: A Thief's End, we might also tremble at the thought of a Nathan Drake without another adventure to distract him. 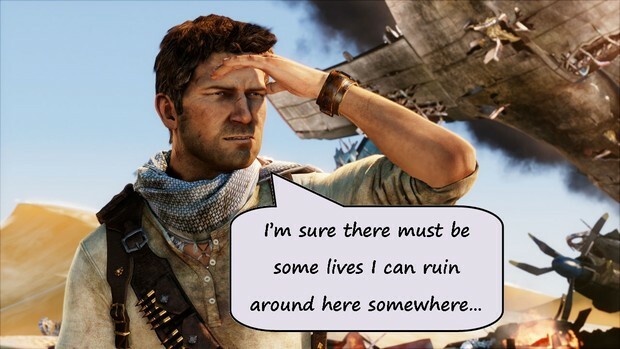 How much damage could a bored Nathan Drake accomplish? Could we expect to find him pacing the halls of the Smithsonian or the British Museum, punching tourists and knocking over the exhibits? And no, I still don't think I'm overreacting.